Today I did something I know I am going to regret for the rest of my life. A little background first. 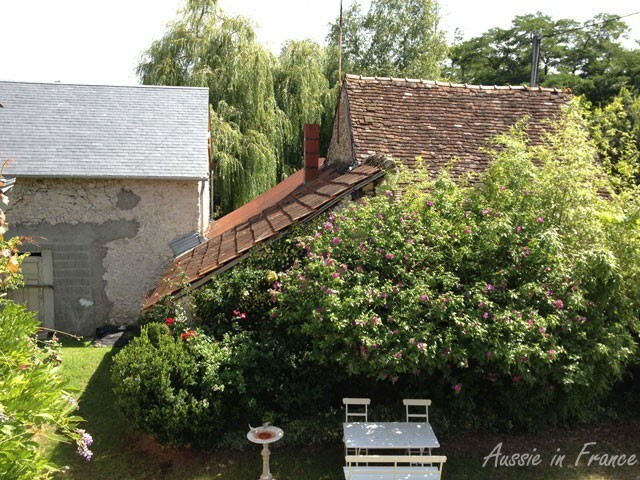 Our house in Blois, Closerie Falaiseau, where we will be moving permanently in October 2014, was built in 1584, just like a similar house on the left (the houses were built by two brothers). Apart from the main house, we have a barn, a former pigsty, an open sheltered area and a workshop on the left, and another barn and a little house, built much more recently in steps and stages, on the right. 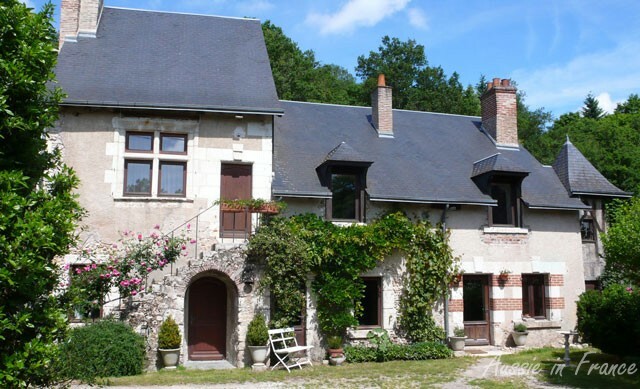 For the moment, we have divided the main house into two, upstairs and downstairs, and we are renting out the bottom part as tourist accommodation until we move. After that, Jean Michel is going to demolish the unattractive half of the little house, leaving the other half to form a double garage. He will then convert the barn behind it into a gîte (vacation rental). On the right of the little house, there are three modern homes, all built along the same lines, on quite large plots of land. Our neighbours are not keen gardeners and the area closest to the little house is rather unkempt. We recently had to ask them to lop part of their weeping willow which is threatening to damage the roof of our barn. There is an old wooden lean-to up against our barn inside their property. They have a wire fence and a somewhat incongruous, expensive remote-controlled gate that was installed last year. When we arrived last weekend, we were surprised to see that two panels of wood had been erected along the fence on the side near the stone wall of the little house. 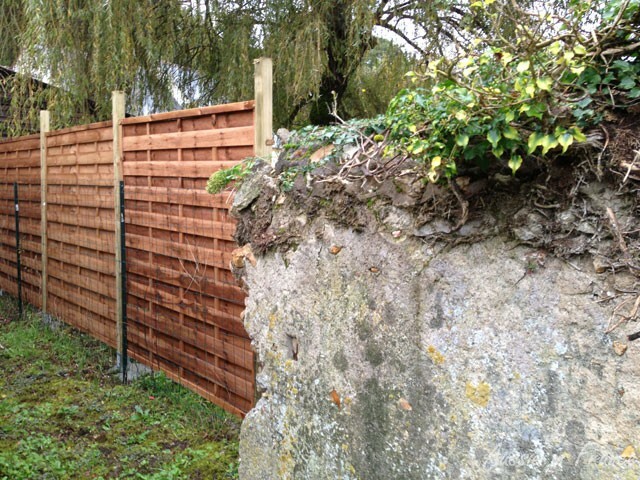 We initially thought they were going to continue the panels along the entire fence. But no, the panels were then continued at right angles to the first, ending at the lean-to. Strange. Then next thing we saw a wire fence WITH A GATE on the other side, forming an enclosure, the sort you keep poultry in. Great! 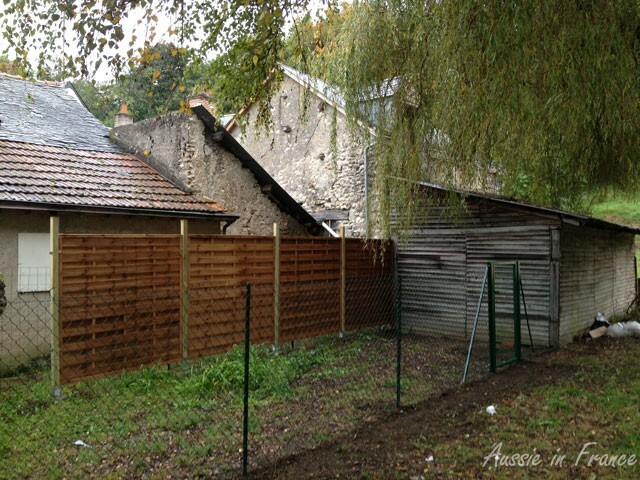 A chicken yard, just next to the future garden of the gîte. Noise, smells, etc. Not to mention the eyesore created by the wooden panels. How is this going to affect the popularity of our rental accommdation? We tried to find out more but the workers claimed they didn’t know why they were building the enclosure. This morning, after phoning the local authorities and being told that there are no regulations about keeping poultry unless there are more than 50 birds, I decided to go and have a look. And lo and behold, the enclosure now contained a goose and a few chickens. The neighbour’s three children were standing watching them. That is when I committed the fatal error. I took a photo of the poultry. For the blog. As I did so, I heard someone shouting, “What are you doing? You can’t take photos. It’s private property.” The mother marched down to the gate, repeating the same thing. When she arrived, I explained that we were worried about having the poultry yard next to our future gîte. She said everyone else in the street had poultry yards and it was for the children. I said that I perfectly understood but wondered why it was on our side, when they had such a large property. It seems the lean-to was originally built for that purpose and that they have had poultry cooped up in there for the last month. They’ve already lost two ducks. Well, they might all just die off, I thought. Then she started on about the photo again, so I proceeded to take it off my camera. The problem was that I couldn’t really tell her I had taken it for my blog ! She told me that she herself was a very calm person but that her husband had a terrible temper and would be furious if he found out I was taking photos. She also complained that the dormer window in the barn, which unfortunately for us fronts onto their property, prevents her from walking around in her nightie in the yard. Considering there’s only a wire fence, you’d wonder why that would matter! In any case, I apologised and said I hadn’t intended to offend her in any way. I then went off to tell Jean Michel about the incredibly stupid thing I’d done. He said it was a pity but I shouldn’t worry. I went back to my planting and suddenly heard shouting. The neighbour’s husband was upraiding Jean Michel over the fence at the back of the house and threatening to go to a lawyer to stop me taking photos. My heart sank. After he stormed off, I suggested I go and apologize but Jean Michel said I had nothing to apologize for. It wasn’t as though I was on his property or taking photos of his children. I could have kicked myself for being so stupid. “Don’t worry. C’est un caractériel“, he said, which roughly means he’s totally unstable. 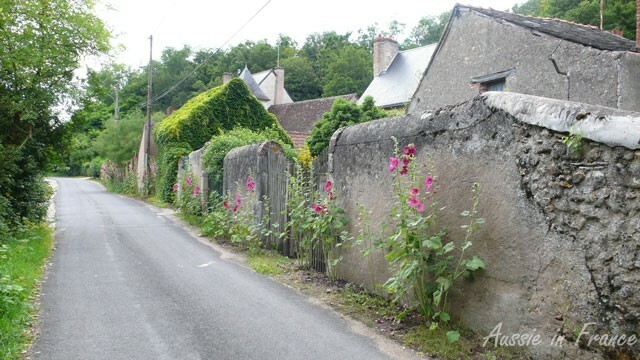 But when we came home after shopping in the afternoon, the neighbour had parked his car in one of the two parking areas that Jean Michel has cleared in the vacant lot across the road that is non-constructible because it’s next to the Loire. Warfare has been declared! This entry was posted in Closerie Falaiseau and tagged Closerie Falaiseau. Bookmark the permalink. Uh oh. My guess is you will have low level niggling forever now. Luckily I reckon JM will be brilliant at dealing with people like this if it comes to a head, but I don’t suppose he wants to be cast in that role. If you are lucky the poultry will be viewed as a lovely rural addition by your guests. The smell and flies rather than the noise is the worry (unless they have a rooster as well). I loved the bit about walking around in her nightie! How much time does she think people spend up in the attic of an unrestored barn for the chance of perving at her? Leave a note on their car politely saying that you are pleased they are happy with the new parking arrangements and naturally it will be their turn to clear the area next time, and for them to let you know when they want to do it, and that you appreciate their wanting to help with improving the neighbourhood, etc. One of the problems is that they are not French. I didn’t want to mention this in order not to appear racist, but I think I would have handled things better had they been French because I would probably have understood them better. I think a rooster is definitely going to be part of the ménagerie though. The husband didn’t actually have a conversation with JM, just walked round in circles on his side of the fence yelling his head off. I think the parking thing will eventually sort itself out because I’m pretty sure he had the automatic gate put in so that he doesn’t have to get out of his car. Parking it outside his gate means he has to walk quite a distance to his front door. I think we might just ignore it and see what happens. The future of our gîte is somewhat compromised though. I’m just hoping that in the end, the kids or the mother get sick of having to look after them. I feel a right fool though. Oh dear, oh dear. I find this is a regular problem in France and I’m so sorry that it has found you. We have a horrid situation with our neighbor has well – I won’t go into details but suffice it to say that he is un “caracteriel” also. Honestly, I wouldn’t try to go and talk to him or apologize – I don’t really think that is “received” here. My French friends have told me that it is considered manipulative. I would just be cold back and go about your business – there is only one way to deal with bullies! Bon chance! No, JM certainly doesn’t think apologising would do any good. It’s interesting about the French considering it to be manipulative. I’ll bear that in mind! Oh no, that’s bad… You could have said something along the lines of “oh, they are so cute, I want to send my mum/daughter/friend a picture of them” instead of acting guilty, now they’ll think you had something negative in mind. Why didn’t you tell them the truth, that it was for your blog on ‘la vie à la campagne en France’? Oh, Pat, I rewrote the scenario half the night! The trouble is I was brought up to be excessively honest (my father was a judge) and I need preparation to be able to lie particularly with someone yelling at me! I thought I’d have a neighbours’ party next year rather than invite them over. I seriously don’t think it would go over well otherwise. Unfortunately I think we’re going to have a rooster as well. Gee, I wouldn’t mind the frogs even though I’m personally scared of them. In my home town in Australia, there are bullfrogs everywhere that make an incredible racket just before it rains. I do wonder what the police could have done about it! No, we won’t let it escalate. We’re certainly not retaliating. Until we see that he’s stopped taking our parking space, we’ll just park both the cars in the other one (or one in the garage). In general I try to avoid conflict even when I am ‘in the right’. In your case I would go out of my way to be charming – at least for a while, until I was sure that war has well and truly been declared. After that I guess I would maintain a cool politeness and always try to maintain the ‘higher ground’. You can’t control their actions and reactions but you can control your own. However, there comes a time when you have to show that you won’t be messed around!! I was actually very polite and apologetic to the woman and she seemed to be accepting that. I was a bit stunned when her husand then started yelling at Jean Michel without actually even looking at him and I was very upset about the parking because of what it represented. Hello Fleur, thank you commenting. That is probably what I would do in Australia or NZ, but I’m not sure how it would work here, particularly as I think they probably don’t drink alcohol for ethnic reasons. I’m just hoping it will all fizz out with time but I’m a little depressed about having the poultry yard around for a while. Thanks, Jill, I’m just going to hope things improve with time. Thanks, Jane. We had no idea they were like that, but we would have bought it anyway, I have to say! Our next door neighbours in Australia always had chickens which never bothered us. It’s more the geese that I’m worried about and the fact that it’s reall right on the doorsteps of the future gîte. I’ll definitely be polite and friendly even though the husband told Jean Michel not to talk to him ever again! Hi, rosemary, sounds like a sticky situation. You may want to make up with the meighbors before you starting running yours gite. They can make it difficult for your guests. Normally, the “locals” (those who had been at the place longer than the new comer) dont like too much the gite guests/tourists. Bon courage! 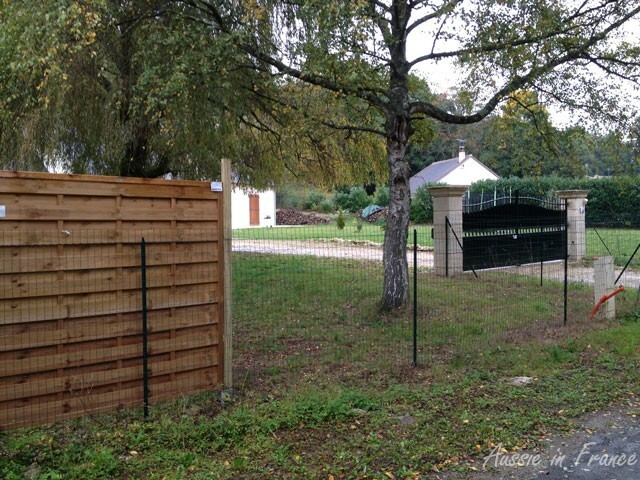 Hi Angela, unfortunately we don’t know what’s going to happen to our gite project because we can hardly provide luxury accommodation next to a farmyard with geese, roosters and chickens. And I fear there is nothing we can do about these neighbors who have a whole ethnic community to support them while we’re newcomers to te area. Even had I not upset them they would never remove their enclosure. We’re currently pondering the situation. 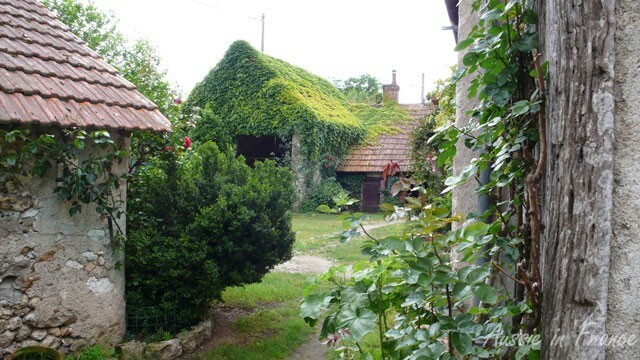 Hi, rosemary, btw, from my extensive experience as gite guest, I check out the morning if woken up by noises (animal or human or machine), as the whole idea of going all the way to the countryside is to be able to sleep in. Most B&B places offers breakfast up to 11am for that reason. Again, bon courage! Maybe it’s time to start putting out food for the local foxes. I thought of that but they lock them away at night! It’s been a few months now, how is the neighbour war going? We think they’ve moved! They appeared to have packed up everything about 10 days ago. We’re hoping it wasn’t a false alert and they’ve just gone on holidays … but they took the chickens with them. The pics from your latest post on eggs and language led me back here. Now I’m wondering what happened in the end? Did the neighbours move away? Hopefully! Hi Pamela, they actually moved away shortly afterwards. The first thing we asked the new neighbours was “are you going to have a poultry yard”. No, but they have now have the two most annoying dogs imaginable. Much worse than the chickens I can tell you! They have a little one that barks every time we go near our vegetable garden. Also, we’ve decided not to redo the little house after all. Just goes to show that you never know what life will bring.